Liturgical Musicians: Do We Act Like Children? New Translations: It's Still English! 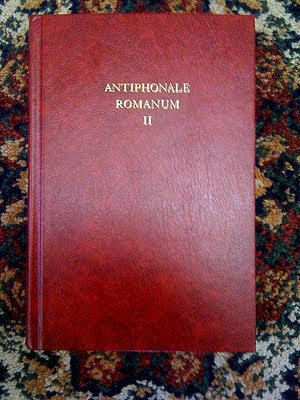 My edition of the new Antiphonale Romanum II arrived via Fedex a few minutes ago - all 780 pages of it. This book provides the Gregorian music for Vespers for Sundays and Feasts (Volume I was the Liber Hymnarius). It is absolutely stunning in its production values, and the product of many years of work by the Solesmes monastery. The monks set out to restore some melodies, adapt the traditional music for the new needs needs of the three-year cycle of readings ,and make possible music for those readings and antiphons that had no previous setting in the older books - and did so by looking at the ancient chant books to recover some lost material and adapt older material. 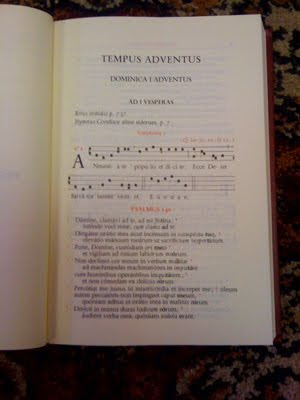 As explained in detail on this MusicaSacred thread, the book provides Vespers for Advent, Nativity to Epiphany with feast days, along with Lent, Passion week, Triduum, and Easter season. It has the Magnificat antiphons listed separately for years A, B, and C, and Concluding prayers for Ordinary Sundays, Solemnities of the Lord. It has a 4-week psalter with hymns, antiphons, pointed psalms, canticles, readings, short responsories, and intercessions. Propers of the Saints. 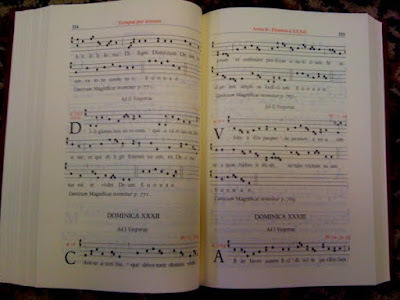 It includes common and solemn tones for common and solemn intonations, tones for sung reading, responsories, intercessions, prayers, concluding rituales. It has an appendix with the pointed Magnificat in all tones, along with alternative hymn tunes for Pange lingua and Vexilla regis. 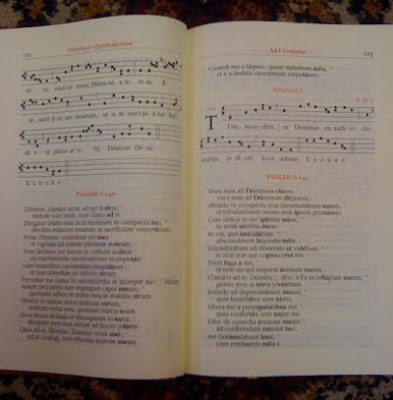 The 25th anniversary of the typical edition of the Order for Singing the Office (commanded to be printed by Holy Father John Paul II on March 25, 1983), which responded through a reordering of chants to the needs of those who carry out the celebration of the Liturgy of the Hours in Latin, has already been celebrated. After that edition, a thorough work has been undertaken of melodical restoration of antiphons, a number of which were restored according to old, forgotten manuscript mediaeval sources. Now this repertory of chant merits to be employed in the Divine Office according to the Roman Liturgy, as the Fathers of the OEcumical Council Vatican II have commanded: «Let the treasure of sacred music be preserved and promoted with extreme care.» (SC 114) Hence, this congregation, according to the powers granted by Holy Father Benedict XVI, taking into account the work prepared by the monks of Solesmes, and having heard the Pontifical Institute of Sacred Music as well, approved the introduction of several changes concerning antiphons and responsories in the version of the Order for Singing the Office currently in force. This dicastery will be in charge of making public law the aforementioned changes and ammendments. Anything to the contrary notwithstanding. Many melodies are restored, but I can't comment on which ones and how. I'm curious about the structural changes but I do not know the details. The notation is entirely reset with some newer (older) neumes not found in preconciliar chant books. The ictus is eliminated, which doesn't seem to be much of an issue given the shorter length of antiphons, but I don't think there is any question that the elimination of the episema and the dotted punctum is going to create some confusion for people who are used to singing from existing chant books. I would like to examine it more in depth, but I have to part with my copy tomorrow to send to William Mahrt, who will be able to explain more. A special thank you to my Rome benefactor who sent this to me! You can order a copy from Solesmes for about $54.00 plus shipping. 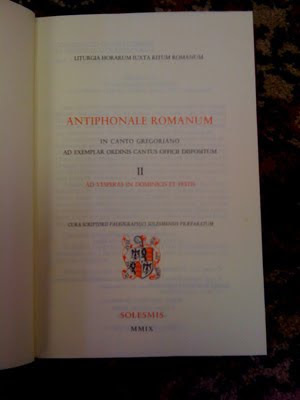 Given that this is the digital, I would like to make a suggestion: Solesmes and the Vatican should grant permission to the CMAA (Musicasacra.com) to put this entire book online immediately. It will not hurt sales; just the reverse. Very few these days will pay this kind of money for something they can't see. Let people use it online, print the pages, sing Vespers, and then people see the need for the physical copy. I have my doubts, in fact, that this wonderful work will achieve its much-needed circulation without being online. This will also help poor parishes that have no means of buying this book. I'll make a separate inquiry but if anyone at Solesmes is reading this, please forward the post and let me know. Again, we can have a gorgeous scan up in a matter of one week or so.